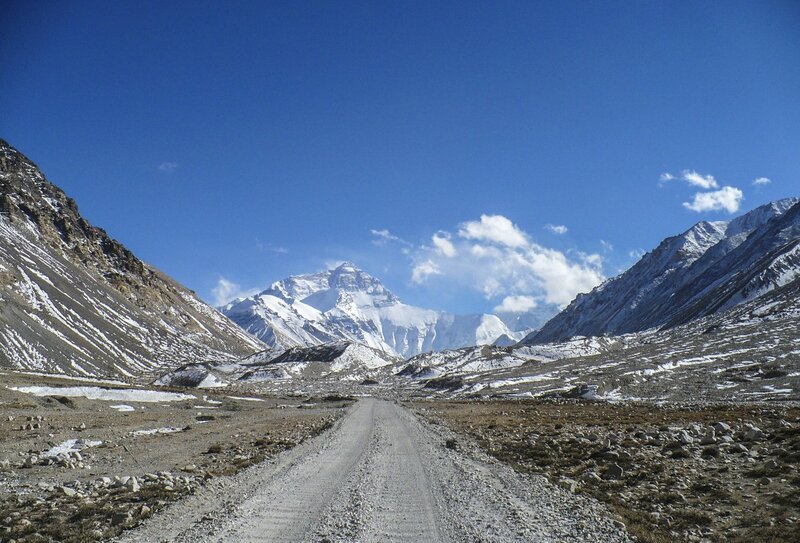 An epic trek to the foot of Mount Everest! Hike to the foot of the world’s tallest mountain! 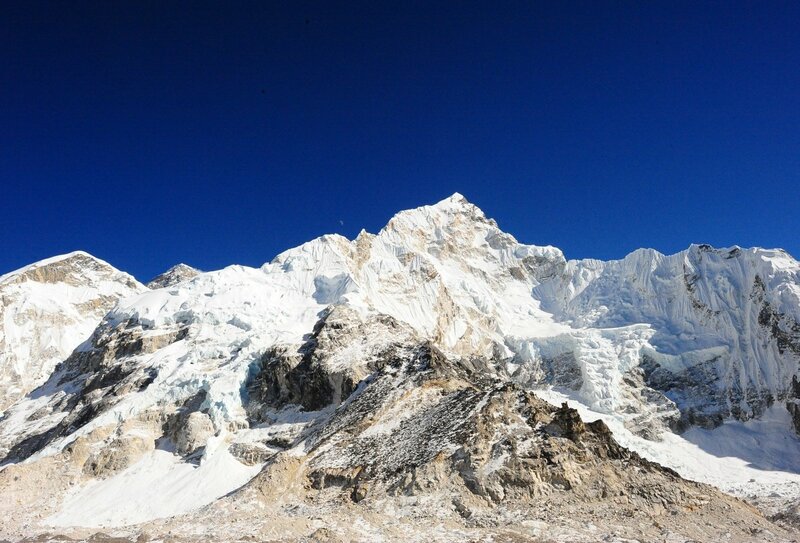 Snap a picture at Everest Base Camp – proof of your epic achievement! Internal mountain flight between Kathmandu and Lukla included! Prepare for an incredible adventure in the Nepalese mountains! Hike to the foot of the world’s tallest mountain and soak up the views of the incredible natural surroundings. Following expert Sherpa guides and porters, we’ll climb to around 5300m above sea level, passing through beautiful alpine meadows, lush rhododendron forests and spectacular glacier moraines. We’ll take things nice and easy, allowing time to enjoy the views and acclimatise to the rising altitude. 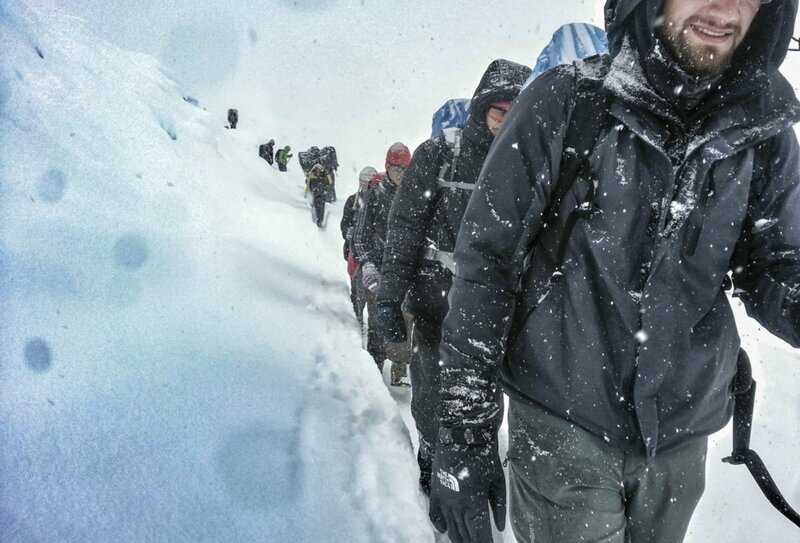 There’s no greater feeling than conquering the slopes and arriving at Everest Base Camp. Challenge yourself and have an adventure of a lifetime on this epic 15-day trip! You should arrive into Tribhuvan International Airport today and make your own way to your accommodation in Kathmandu by taxi. Attend an evening welcome meeting where you can get to know the rest of the group, and ask any questions you may have about the upcoming adventures! Today the adventure begins! We’ll leave Kathmandu and hop on a mountain flight to Lukla. After we land, we’ll meet our Sherpa guides and porters and begin trekking towards Everest Base Camp, stopping for the night in Phakding. We’ll spend the next two days in this area so that we can acclimatise to the altitude. 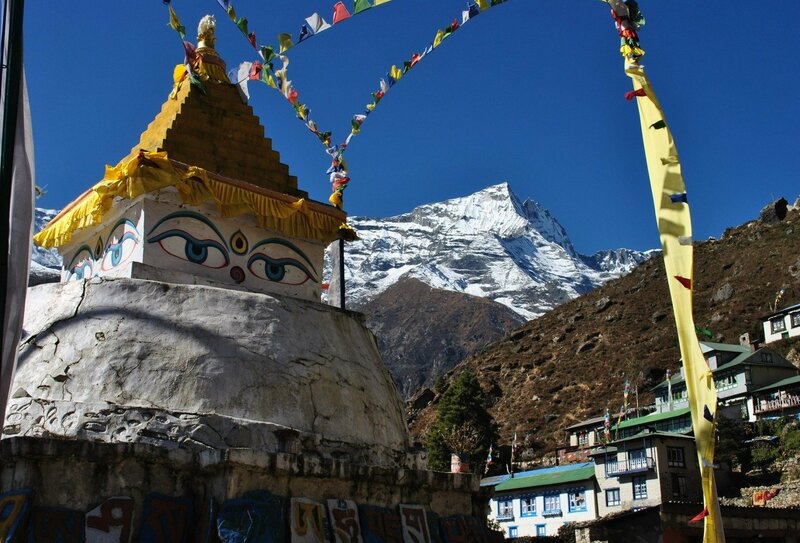 We’ll enjoy a few gentle day hikes to the surrounding villages of Thame and Khumjung and also enjoy our first glimpse of Everest itself! 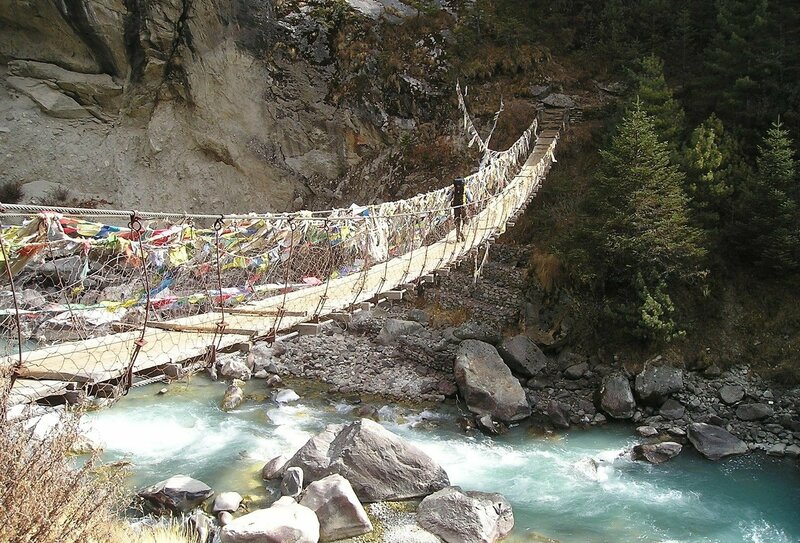 We’ll set off on a full day hike through enchanting rhododendron forests, past mani walls and across suspension bridges. Today, we’ll pass through the small village of Debocheand journey across alpine meadows and barley fields. 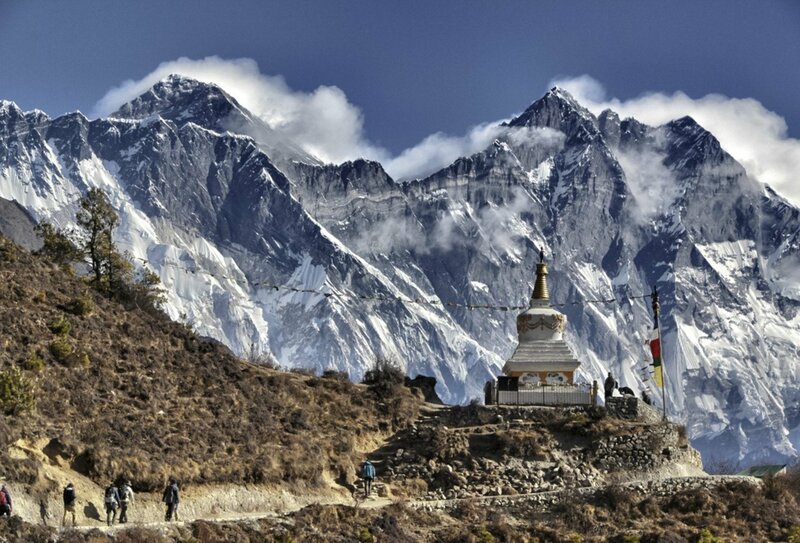 Our hike ends in Dingboche, where we’ll spend a full day acclimatising to the altitude. 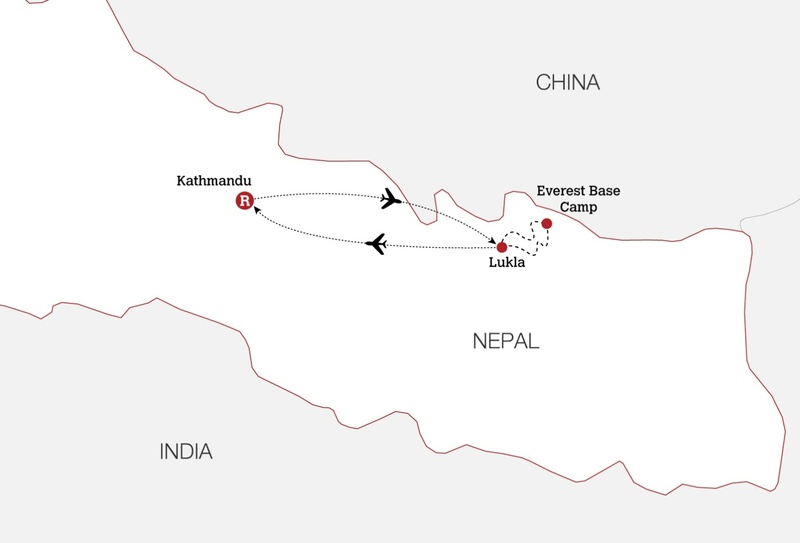 We continue our journey to Everest Base Camp today. We’ll pass yak pastures and the moraine of the Khumbu Glacier, before climbing the steep slopes that lead to Gorak Shep. We’ll then walk to Lobuche for an unforgettable sunset. 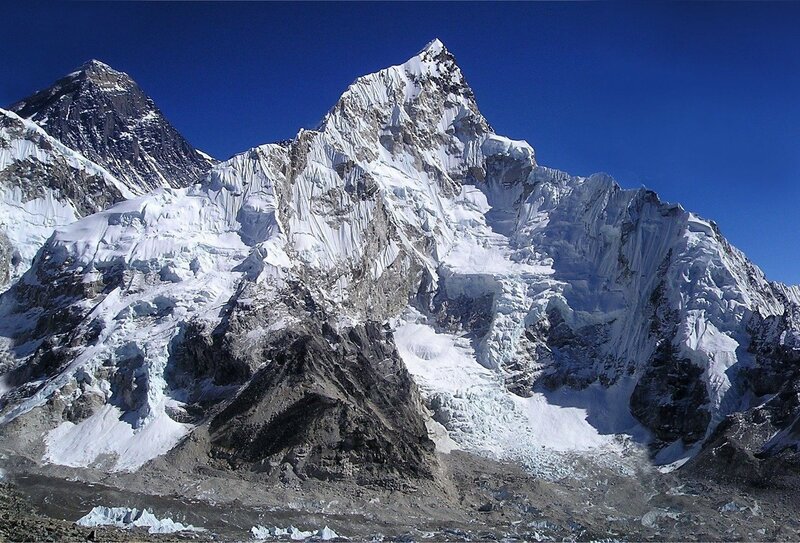 We’ll reach Everest Base Camp today! This is the most challenging day of trekking as we’ll be walking at high altitudes. We’ll take things slow and soak up the incredible surroundings as we walk. We’ll arrive at Base Camp this afternoon. You did it! We’ll then make our way back to Gorak Shep for the night. Rise early for our sunrise hike to Kala Pattar. Then, it’s time to begin our descent to Pheriche, where we’ll spend the night. The descent continues as we hike through Pangboche, the highest permanent settlement in the region. 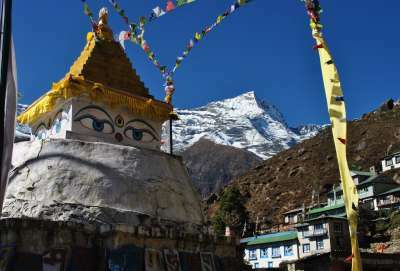 We’ll see the mighty gompa (Buddhist temple) which is the oldest example of its kind in Khumbu. We’ll then head back to Thyangboche where we’ll spend the night. Another full day of trekking downhill to Monjo, a small village where we’ll spend the night. Our last day of trekking brings us to Lukla where we can relax and recover from our epic hike to Everest Base Camp and back! Time to hop on a plane and fly back to Kathmandu. 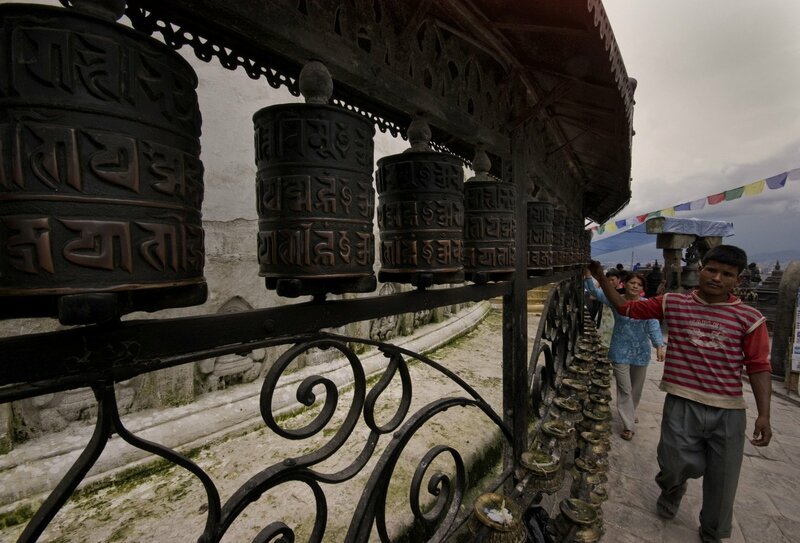 The rest of the day is yours to explore, relax and reflect on your time in Nepal! Your trip ends today. Head back to the airport in your own time and flyhome/on to your next travel adventure! A return transfer is not included but is easy to arrange. Please note that details of this trip are subject to change due to changing weather conditions and any other factors that are outside of the control of our local team. 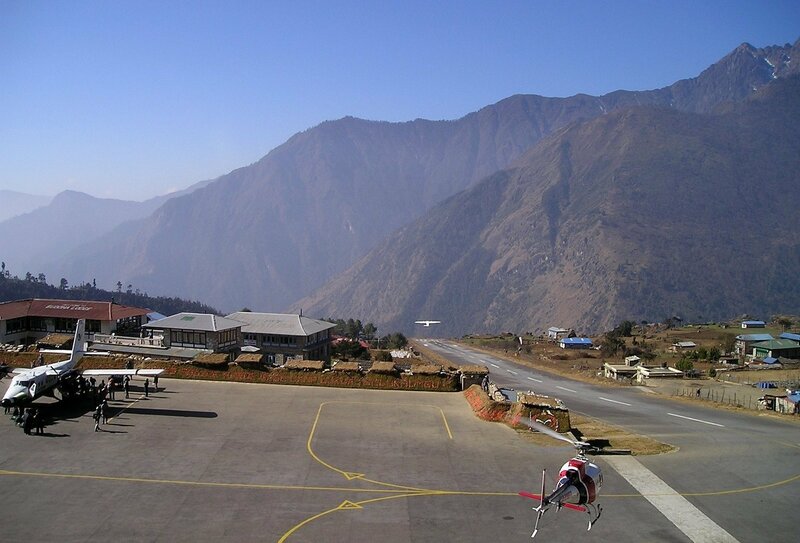 Weather in the Himalayas can changes rapidly which can lead to delays or cancellations to flights to and from Lukla Airport. In the event of flight delays/cancellations, it might become necessary to make the journey by chartered helicopter instead as they are able to operate in some weather that normal flights cannot. The costs for helicopter transfers are not included in your trip and will cost approximately US$700 one way - please ensure you have this money accessible in the event that this situation occurs. 14 nights of accommodation are included on this trip. 2 nights will be spent in hotels/guesthouses and 12 nights will be spent in teahouse lodges. A teahouse is a combination of a guesthouse and a social space. The rooms are usually a mix of twin and multi-share rooms with shared cold-shower bathrooms. Meals are not included on this trip. You will be able to purchase breakfasts and dinners from the teahouses and lunch at one of the trailside restaurants. Food will usually consist of traditional Dal Bhat (rice and lentils) or other simple meals. Some western style food such as pizza and pasta may be available. Please allow £360-470 for meals not included. Arrange your flight to arrive into Kathmandu Tribhuvan International Airport on your programme start date (day 1). An airport transfer is not included but is easy to arrange. A taxi from the airport is easy to arrange. Please note, we can arrange an airport transfer for you when you arrive. Please contact a Travel Advisor for more information. Your tour ends in Kathmandu on your programme end date (day 15), no activities are planned for this day and you are feee to depart at any time. A return airport transport is not included but you can easily take a taxi back to the airport. The minimum age to join this trekking experience is 18 years old. Due to the physical and challenging nature of this trip, a very high level of health and fitness is required. The trek is highly challenging and involves a combination of steep ascents and descents at high altitudes. We recommend embarking on practice hikes before you travel to prepare for the trek. This trip goes above 2800 metres / 9200 feet where it is common for travellers to experience some adverse effects in their health due to the altitude. Please see further information on Acute Mountain Sickness (AMS), High Altitude Cerebral Edema (HACE) and High Altitude Pulmonary Edema (HAPE). 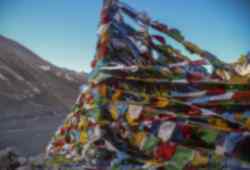 On this trip you will be trekking at more than 2000 meters above sea level, you therefore need to ensure you have suitable travel insurance in place. If you'd like to purchase insurance through us you'll need to select the 'Adventurer' level of cover. It is your responsibility to obtain the necessary visas for your time away. You will need to obtain a visa to enter Nepal. These can usually be obtained in advance of travel or at the airport on arrival for certain nationalities. Please contact you nearest Embassy or High Commission of Nepal for the latest visa information. Do I Need To Be Physically Fit For This Trip? Yes. This trip involves long days of hiking. Some sections can be quite steep and the altitude can make things a little more tiring than usual. While you don’t need to be an Olympic athlete to complete the trek, you should have a good level of fitness. 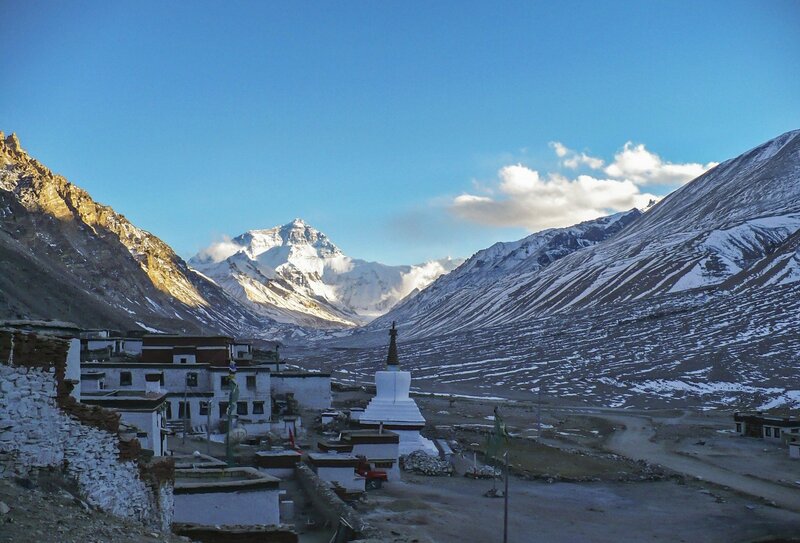 You will climb to approximately 5,300 metres above sea level and you may feel the effects of this altitude. During your trek, you will have a few free days to acclimatise to new altitudes. Bring some tablets to deal with any headaches you may get and remember to drink plenty of water! Is There A Luggage Limit? Pack as light as possible! 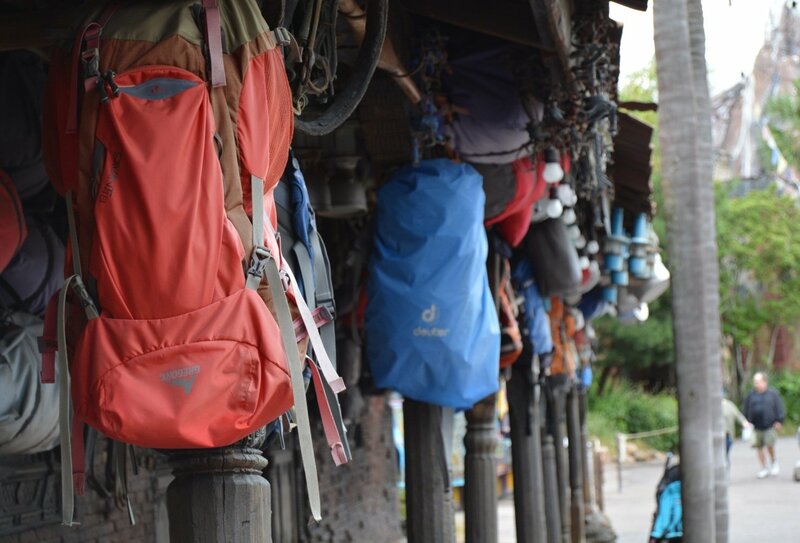 Your trekking gear will be carried by a porter (one porter for every two trekkers) in a shared duffel bag. The maximum the porters are allowed to carry is 10kg per passenger. Bring a plastic bag to keep your stuff separate from your fellow traveller’s in the porter’s bag. You may be able to leave some extra inessential things at the accommodation in Kathmandu (for a fee). What Sort Of Travel Insurance Do I Need? On this trip you will be trekking at more than 2000 meters above sea level so please make sure you have suitable travel insurance in place. If you'd like to purchase insurance through us you'll need to select the 'Adventurer' level of cover. Hi all! I’m booked to go in March but I need an address for my visa. Can someone help out by giving me an address that voulenteers will be staying at?? Thank you.